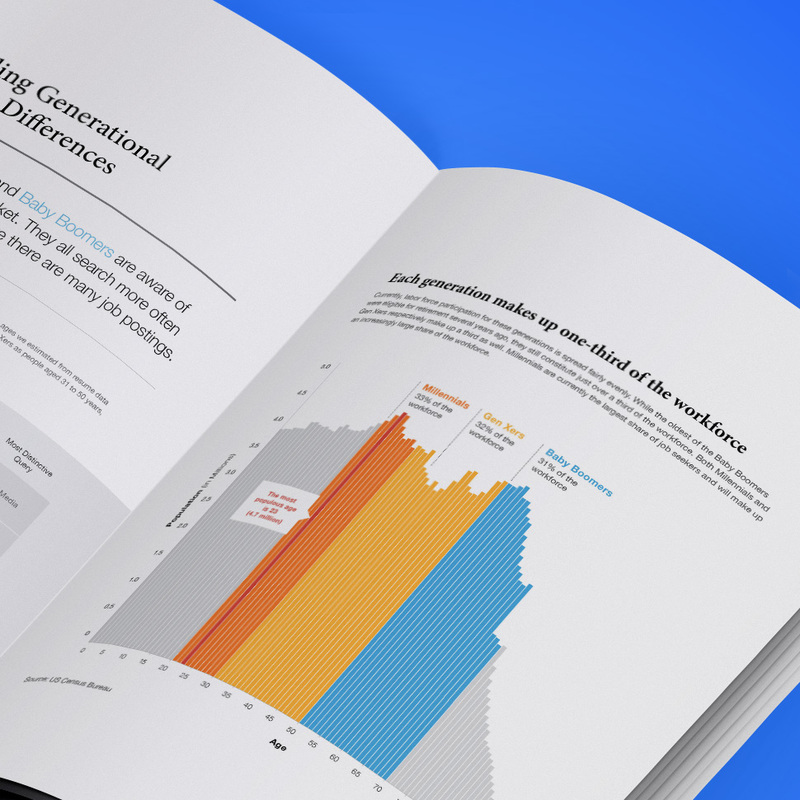 Right now, there are three generations in the U.S. workforce: millennials, generation Xers, and baby boomers. Each of these age cohorts makes up about one third of the workforce, but by 2020, as baby boomers retire, millennials are projected to make up nearly half of the working-age population. At the Indeed Hiring Lab, we took a look at how each of these generations is searching for jobs today to get a better idea of the coming talent opportunities and challenges. In addition to examining the aggregate search data on what millennials, Gen Xers, and baby boomers are looking for, we also talked with employers to learn how they perceive candidates from different generations. In fact, our data show that one consistent commonality between job seekers of all ages is mobile — they all rely on their devices in a job search, even Baby Boomers, although slightly less than the younger generations. 73.4 percent of millennials search on mobile, and 71.3 percent of Gen Xers, and 48.4 percent of baby boomers use mobile too. We also saw a preference for flexible work across generations. Search terms associated with flexible work are consistently among the top terms used by job seekers of any age. This will become increasingly important for employers as the labor market tightens and they compete for talent. In conversation with Jocelyn Lincoln, vice president of Americas recruiting at Kelly Services, she commented that, “the biggest discussions we’re having are around flexible and remote work, and this is a change that affects all generations. This has a lot to do with the portability of much of today’s work.” Attracting the candidates of tomorrow will mean redefining when and where a lot of work takes place. In addition to those similarities, we found some differences that hew more closely to generational stereotypes. Millennials are more likely to use their mobile devices. And they’re less familiar with the labor market compared to older job seekers — Baby Boomers search most often in occupations where the most jobs are available, followed by Gen Xers and then millennials. This suggest that as people age into their careers they get a better sense of what’s available and make decisions accordingly. Gen Xers are often neglected in the discussion about today’s generations, but in some ways, they may emerge as the ideal candidates for many hard-to-fill roles. They’re nearly as mobile as millennials, show more interest in computer and mathematical occupations than the younger set, and will have the experience to fill management occupations as baby boomers retire. Baby boomers are more interested in blue-collar jobs than younger job seekers, meaning we may see shortages in occupations like construction and extraction and transportation and material moving as boomers leave the workforce. Healthcare practitioners and technical occupations are one area where there is low interest from all generations, but particularly from younger generations. Employers in this space will need to develop creative strategies for working around looming shortages, attracting people into these professions, and attracting job seekers from other markets. The Future of Talent Acquisition, April 29, 4:15 a.m.